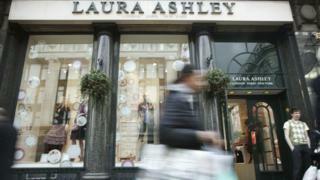 Laura Ashley has warned investors that it will post profits lower than it had forecast for the financial year. It also said it made zero profit for the last six months of 2018 as sales fell 4.2%. "Trading conditions have been difficult," the company said. While fashion sales increased, furniture and decorations fell. The firm's shares fell as much as 22% in London before recovering to a 5% fall, valuing the retailer at £22m. Laura Ashley also said it sold one of its two hotels, the Manor Elstree. However, it insisted it was "committed to developing the hospitality concept and this will be achieved through the licensing model rather than direct ownership". Sales for outlets open at least a year fell 4.2% as Japanese partner Aeon Holdings terminated a licence agreement. In December, the fashion and home furnishings retailer told Press Association it could close about 40 stores in the UK as it plans to expand its presence in China. It insisted that no deadline had been set and no stores earmarked. Laura Ashley, which is controlled by Malayan United Industries (MUI), has already closed some 40 UK stores since 2015. December's reduction will leave it with 120 UK stores. A recent report has shown that some 14 UK shops are closing every day in the tough trading climate.